EATegrity congratulated executive chef, Carl Van Rooyen, and his sous chefs at The Vineyard Hotel for deciding to use grass fed beef for their burgers. The Vineyard Hotel has made a commitment to “living green” and has implemented environmental and social responsible decision making throughout the hotel so we are pleased to see this extending to the Vineyard restaurants too. Carl also believes in supporting local producers instead of importing produce. The choice was not only driven by ethical mindfulness—they had a blind tasting whereby they sourced mince from quite a few suppliers. As Carl says, “we all sat in the chefs office and tried the different burgers- sous chefs and other line chefs. Farmer Angus was chosen – on taste – no one on the panel except for myself knew the sequence. So without even paying attention to the ethics – Farmer Angus wins on taste ! Email (eat@vineyard.co.za) to tell them that you think this is really awesome news or phone (021 657 4500) and make a booking to try out the new, improved burgers. Please note, EATegrity cannot vouch for their other menu items. Another Friday Smile, although it is only a half smile since BEERHOUSE on Long Street, Cape Town, can’t guarantee that foie gras will permanently be off the menu. They did heed the call this time and agreed to remove it from their menu for their next Meet The Brewers event. 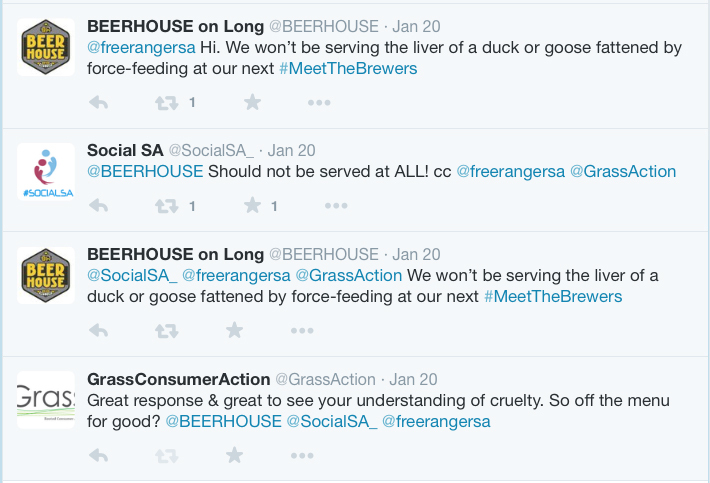 You can contact them (longstreet@beerhouse.co.za) to thank them and ask them please to make it a permanent decision, countrywide. If you want to know more about our food system in South Africa then subscribe and receive a Mindful Monday recipe each week.